The summer is slowly coming to an end and along with it also the end of season of fresh fruits and vegetables. Nevertheless in the last article of our summer miniseries about berry fruits you can still enjoy them. This time you learn more about blackberries. They’re having their high season right now, so you can gather them on your own or just buy them at your local grocery store. Blackberries contain enormous amount of wholesome substances. Their dark color is a sign of health because it’s caused by antioxidants inside. They protect you against serious illnesses, mainly cancer. In a handful of blackberries you find 50 % of recommended daily dose of vitamin C and 36 % of daily dose of vitamin K. Moreover, there is also huge amount of magnesium, potassium, calcium, folic acid and vitamin A. Except berries you can also try to add leafs of bramble to your salad or make a cup of tea from them. They are really tasty and help against inflammatory diseases and diarrhea. Besides above-mentioned reasons, why to eat blackberries, there is their delicious taste. You can use them as a complement to sweet fruits and green vegetables. Strengthen your immunity by our original recipe before the wave of virus infections comes. 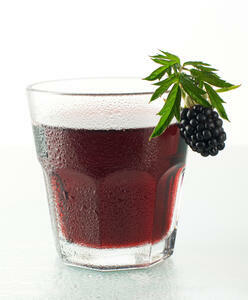 Don't forget to select an appropriate juicer to prepare fresh blackberry juice.